After completing the generally ill-received film Doogal, I found myself pondering a single question: How in the world could something like this happen? Surely Harvey Weinstein finds himself wondering the same thing. I mean on paper (and even in trailers), this one looks fantastic: It’s got an absolutely stellar cast, a host of original characters, a plot that mimics large scale fantasy adventures like Lord of the Rings, and a massive following in its native UK (where it’s known as The Magic Roundabout). However, in execution, this one manages to fall victim to just about every conceivable mark of poor film making: It’s poorly developed, oddly paced, downright boring at times, and certainly not as funny as a film featuring the likes of Jimmy Fallon, Chevy Chase, Jon Stewart, Whoopi Goldberg, Kevin “Silent Bob” Smith, and Bill Hader (to mention a few) should be. But before we get to all that, let’s take moment to break down the plot structure shall we? 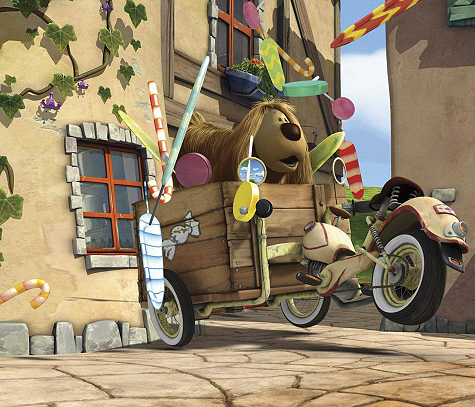 This is the story of Doogal (Daniel Tay), a fuzz-ball candy-loving pooch who, after a series of irresponsible (and rather annoying) mishaps finds himself embarking upon a mission to save the world and perhaps more importantly his beloved owner Florence. See it turns out that in the center of town, there exists a roundabout (that’s a merry-go-round to you and me) that, for whatever reason, serves as the eternal prison for an evil spring-legged wizard named Zeebad (Jon Stewart). Doogal, through an obsession for candy and a blatant act of deceit, manages to free the evil Zeebad from his tomb and with that his dastardly plan of freezing the earth forever with the power of three mysterious diamonds scattered about the kingdom. 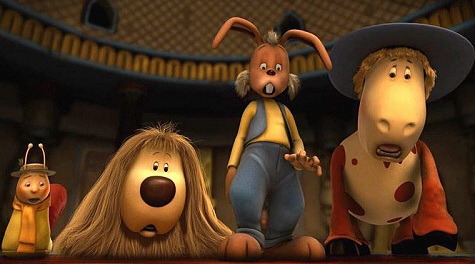 Never mind that Doogal can single-handedly be attributed to causing the entire disaster in the first place, we’re supposed to cheer on this little fur ball as he recruits pals Dylan, a guitar-playing rabbit (voiced by Jimmy Fallon), Ermintrude, an opera-singing cow (Whoopi Goldberg), Train, a choo-choo train with personality (Chevy Chase) and Brian, a well-spoken snail with a crush on the cow (William H Macy). Together this ragtag group of heroes traverse ice-capped mountains, navigate fiery pits of lava, and sail across vast oceans on the perilous journey to recover each of the three diamonds before Zeebad can. Fortunately when things get really desperate they can call upon the good living spring wizard guy Zebedee (voiced by living legend Ian McKellen). Oh and in case you were wondering how they fit in, Kevin Smith voices a moose with a terrible case of flatulence and Bill Hader’s acting abilities are harnessed for purpose of a living British toy soldier named Sam. Even the thankless miscellaneous voices of extras and background characters aren’t generic here as The Office’s John Krasinski (who plays the infectiously drab Jim Halpert) was called upon for the task. Again how could this much talent possibly derail? 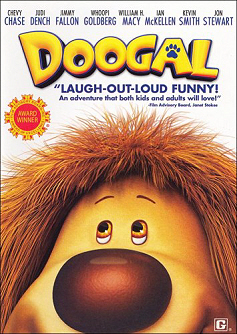 Perhaps part of the problem stems from the fact that unlike most animated feature films, which basically start life with a loosely drafted script for which the actors can play with while adlibbing, Doogal was already a completed film when the cast got started. As a result, what actually took place in the production process was a voice-over dub job rather than an original animated feature. There is little doubt that the restrictions of trying to keep time with the original sequences (and harder still, attempts to match mouth flaps) ate into the comedic abilities of all involved- and it shows. Then there’s the sheer oddness of it all. Granted as Pixar and DreamWorks have proven time and time again, part of the charm of the computer animated medium is the ability to caricaturize reality but here it borders on Alice in Wonderland style wackiness. Merry-go-rounds that serve as prisons for evil sorcerers; that are in daily use mind you, living metal springs amidst a group of talking animals, a Moose that cuts the cheese constantly yet complains that the evil wizard stinks, and a lead character that nobody can be sure whether they love or hate are a few of the examples I can recall. If I can offset my complaints with one simple justification, it would be this: The cute visuals will likely appeal to younger children not yet mature enough to watch this type of picture for intelligent dialog or masterful pacing. The slapstick will most certainly appeal as well. The majority of the humor included, however, is based on the concept of rapid-fire pop culture references. Some of these work, others are pretty corny. The sad reality is that by the time the audience is socially aware enough to recognize the references, they’ll likely also be aware enough to realize this really isn’t solid story telling. In all this is one most fans of quality computer animation should pass over. Very young kids might enjoy the visuals and the odd British charm throughout but everyone else would be better off looking elsewhere.